Congratulations to this month’s “Certificate of the Month Winner”, Kris Cerone, from Escondido Adult School in Escondido, California. Escondido Adult School, which is a part of the Escondido Union High School District, works to provide academic, vocational and enrichment needs of adult students thru their adult and community education courses. 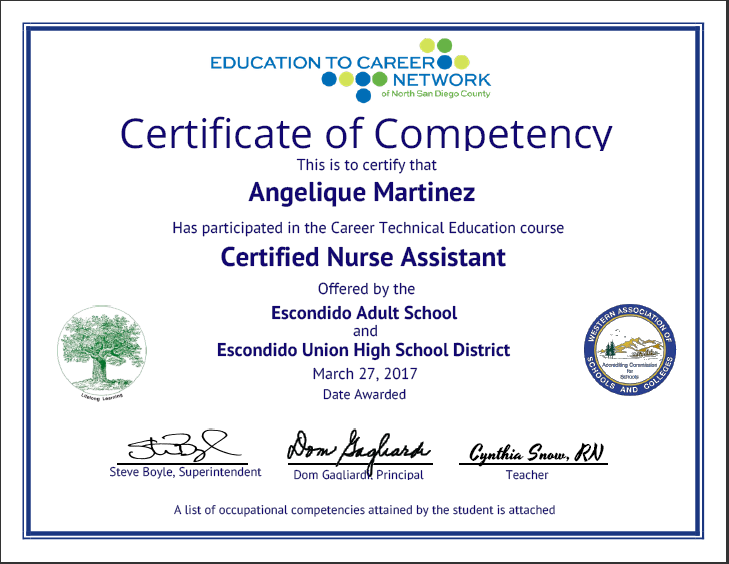 Prior to SimpleCert, the school office had a time consuming program of manual certificate creation for Escondido Adult School, that involved manually creating and distributing as many as 600 certificates at a time. In addition, Kris also needed a way to distribute course materials to each graduating student at Escondido. SimpleCert automated Escondido’s certificate distribution program, and the ability to add attachments to her notification emails allowed Kris to include the course materials automatically. Thus, the time it takes to do certificates has reduced significantly and continues to go down as we get better at what we are doing. Kris also makes efficient use of SimpleCert’s merge variables – both on her certificate and in her notification emails. Kris worked with SimpleCert Support to come up with a way to add an additional merge variable – another email field, for the class instructor’s email address. Even though this merge field is available in Kris’s notification emails, it is not a part of her certificate design. The end result is a highly customized certificate template, that provides Kris with an effective and automated certificate management system. In addition to being a SimpleCert power user, Kris has also been an advocate and driving force behind some of the most popular SimpleCert feature enhancements . Thanks Kris for your continued support of SimpleCert, and for being an advocate for ways to improve SimpleCert! It is our pleasure, and our honor to be able to work with you. And congratulations on being this month’s Certificate of the Month! We are hoping this will be the first of many certificates to showcase our client’s use of the application. Do you want to be part of our portfolio? If so contact inquires@simplecert.co.